A few days before Israel bombed it for eight consecutive days, Gaza hosted a visit byCindy and Craig Corrie. Their daughter, Rachel, was murdered by an Israeli soldier in 2003 as she tried to prevent bulldozers from demolishing Palestinian homes in Rafah, a city in southern Gaza. It was the Corries’ first visit to Gaza since an Israeli court ruling in August this year, which rejected a lawsuit they had taken over Rachel’s murder. The Haifa District Court declared that the Israeli state and military were not responsible for her death. The Electronic Intifada contributor Joe Catron interviewed Craig Corrie on 11 November, the last night of the Corries’ latest visit to Gaza. Joe Catron: You’ve been here in the Gaza Strip for five days. How have you found it? Craig Corrie: It’s always kind of hard to take into your head. The last time we were here was in September 2009. That would have been about eight months after the attack on Gaza [Operation Cast Lead]. And we had been here one previous time, in March of that year. Then, the destruction was obvious everywhere. You could see rubble, people living in the rubble, people living in tents. Every person was shell-shocked. If you talked to them, they all had a family member who was killed or maimed. The fear, of course, affected everybody. In a very real way, it was quite fresh on people’s minds. As you come in this time, there’s construction going on. It seems to be happening on glossy, sort of big things. Part of that is to show off, I figure. I’m not totally against that. People, even the de facto government, have to have some means of pride. One of the things we’ve noticed is the shops. Not only are shops open, but they have a lot on the shelves. But somebody pointed out that there aren’t very many people in those shops. There’s still a lot of unemployment. And I’m told that poverty’s actually getting worse instead of better. We went to the Qattan Centre for the Child this morning, where we had been before, right after Cast Lead. In 2009, they were working vigorously on trying to get children drawing. All of the pictures were full of tanks, bulldozers, soldiers. They pointed out that there was also a sun in most of the pictures: some sort of symbol of something better. The art we saw today was more sophisticated. So I think it was by older children, although it’s been some time; it might be the same children. But it wasn’t tanks and bombs all over the place this time. So maybe that’s better. And yet, it was five days, as you said. You can’t get under the surface in five days, particularly when you’re here with a delegation [the Corries were part of an Interfaith Peace-Builders’ group]. And we’ve been very busy. We’ve gone from group to group to group, and that’s just skimming the top of the waves. I’m really glad to be here. I’m glad to see the people we haven’t seen for so long. I hear their hurt, in so many different ways. A 13-year-old boy was shot and killed the day before yesterday. Seeing his father, with the pain so fresh, he doesn’t know what it is yet. We couldn’t communicate well through an interpreter; maybe through the eyes. I’ve been there in a way. People here have all been there in some way or another, but it’s different for everybody. JC: You recently took part in a similar delegation to the West Bank, and attended the verdict of your civil trial in Israel. What similarities and differences do you see in these three divisions of historic Palestine? CC: One of the advantages of our trial is that my wife and I lived for nine months in Haifa. So we could know people better. We had a number of Jewish Israeli friends, and we couldn’t have done it without them or our Arab friends inside ’48 [present-day Israel]. On the trip we just did, the best day for me was when I skipped out for a few hours in Haifa, ran around, and happened into some of the guys I knew when I was there. They weren’t expecting me; they might have known I’d come back someday, but didn’t think it would be this year. Those friendships are wonderful. That part I like. But there was so little emotional payback from the trial, it’s difficult. You know how after you burn yourself, as you get close to a hot stove, it starts to hurt more the closer you get to the heat? That’s the way I felt going back to Israel. We had a little bit of time in the West Bank. But again, we were going from one group to another. So in a way, you normalize all of this. The people we traveled with, who hadn’t seen it before, were outraged and amazed. I’ve been there before. But it doesn’t have as much impact as coming here does. Well, there’s probably not as much of an impact now. The first time was incredibly emotional, because I knew people had cared for Rachel. That was incredibly important. When Rachel was killed, one of the messages I wanted to get through to the people of Rafah was to thank them: thank them for being a father to Rachel when I couldn’t be. I know they were because of the way she wrote about the people she met and how much they meant to her. She wrote that the most important thing she ever did in her life was to come to Rafah. And I needed them to know that. It was her choice to come. Of course it was an unbelievable loss to us when she was killed. But she was doing something important, something she loved. JC: You mentioned that while you may appeal your civil case, it will no longer require your regular involvement. What will your priorities, and those of the Rachel Corrie Foundation, be now? CC: We’ve got a lot of ideas, so we’ll have to choose among them. 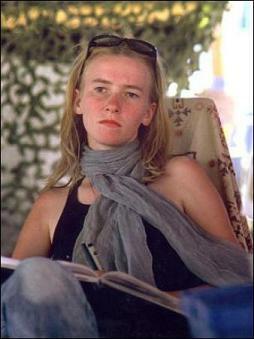 Of course we’ll still stay active in the Rachel Corrie Foundation, and hopefully be a little more active. We have number of thoughts. What’s been great about this trip is getting to talk to some friends here on the ground. They’ve been giving us their ideas about some things we can do. I think it’s most important to listen to the people here. I think the trial was really important. We went into it looking for accountability and some information. We’re not going to get any more information out of it. Now I think we have to figure out a meaningful way to get some of the information we have out to the world. The overarching ruling by the judge was that Rachel was killed as part of a military action, and the State of Israel is not responsible for anything that happens in a war. There are huge problems with that: you can’t be at war when you’re an occupying power, and other things. But having spent 11 months in the army in Vietnam, I know that they are responsible. That ruling alone is far larger than Rachel, and it needs to be challenged. The verdict was so appalling that I think a lot of the world was appalled. We may have lost in that courtroom, but I think we made the best impression we could on the world. And I think we caught Israel somewhat by surprise with the media [coverage] that came out. JC: The trial has been your main commitment for a while, but of course you’re familiar with other Palestine solidarity efforts. What are your insights on them? CC: My wife doesn’t like me to share this part, but I was sort of slow coming to BDS[boycott, divestment and sanctions]. I’ve talked to some people, actually on this trip, who helped me with some of the well-thought-out ways, when you look at the actual call, how targeted it is. I used to work in insurance, which involved some investing. So in terms of divestment, that to me was a no-brainer. If you own the stock, like in Caterpillar, then you’re profiting from things that are immoral. It didn’t seem to me that it takes a discussion. It takes a call to your stockbroker to get out. Why talk about it? Especially if you’re a Christian church. You can’t have the values of a church, then go profit from people’s suffering. What I worried about was group punishment. Israel, as well as the United States, does that sort of thing. But I’ve had a lot of my questions answered about just how specific the boycotts are. Omar Barghouti, and some people I know, answered them when they were talking to our group. I had a discussion with some friends who are Israeli academics. Of course they don’t like the academic boycott. One thing I found out is that if they go as individuals, not representing their institutions, they aren’t boycotted. That seems very sane to me. There are a whole lot of other things my family and I have done to seek justice and change, not just for our family — that’s more symbolic — but for the Palestinian people. It’s not really anything to do with Rachel. We’re trying to work for the children who are here now, the children Rachel was trying to help. We’ve tried every conventional way I know to do this. We’ve been going to courts in Israel. And we’re trying this, too. It’s one of those examples of things I thought were a little bit nuts, but turned out to work. It’s working. And it’s getting a lot of pushback. That tells me it’s working, and helps it work, by the way. When somebody’s screaming like that, they bring a whole lot more coverage to it. So, thank you Israel for making it a little easier for us, at least. JC:After all your recent experiences in Palestine, what’s the message about them you’ll take back to the United States? CC: It’s hard for me to wrap it all up. What we’ve heard a lot is that the West Bank and Gaza Strip need to be united, and that they’re all one Palestine. I kept hearing over and over that it’s worse than it’s ever been, more in the West Bank than here. And that seems strange if you’re in Ramallah, where the construction is really booming. But I think there’s a growing realization that they’re losing more and more of the land, and a fear that they’re going to end up in little bantustans. It would be a two-state solution, but one of them wouldn’t really be a state and not viable at all, just bantustans. Will the world put up with that? There’s a lot of discussion about one-state versus two-state solutions. I’m not the person to have anything to say about that. But I do think those of us who work on this issue — inside ’48, in the diaspora, in the West Bank, in Gaza — have to think about how we secure the rights of all the people in the area. It may seem absurd, and most people will think there’s a very low chance Canada will come down and take my home in Olympia, Washington. But if they do, I have a right to it back. That’s my right of return. And it ticks me off that just because some legislator in Congress finds it inconvenient to recognize that for the Palestinian people, he’s going to take away my right. When it comes to human rights, we all drink from the same well. And if you poison that well because you think it’s going to hurt your enemy, don’t cry to me when it’s your children that get sick. There are lots of different ways to say that, but it’s a real, immediate thing for me when I come here. What we’re fighting for here is everybody’s rights, the rights we’re all supposed to enjoy. Palestinians have those rights. They’re just not secured. We need to secure them for everyone in the region. Joe Catron is a US activist in Gaza, Palestine. He works with the Centre for Political and Development Studies (CPDS) and other Palestinian groups and international solidarity networks, particularly in support of the boycott, divestment and sanctions and prisoners’ movements. He blogs at joecatron.wordpress.com and tweets at @jncatron.